In bowl mix flour, baking powder, baking soda, salt, oats with a whisk. In another, larger bowl mash bananas really well along with splenda, egg whites, vanilla, applesauce. Slowly add dry ingredients to banana mixture. Scoop mixture into muffin tins (should make 12 muffins). Bake at 350 for 15-20 minutes/toothpick comes out clean. I found these to be too sweet, but I’ve pretty much cut out added sugar from my diet. Next time, I will eliminate the splenda and possibly add a sprinkle of brown sugar on top before baking. Of course you could use regular sugar if that’s your jam. 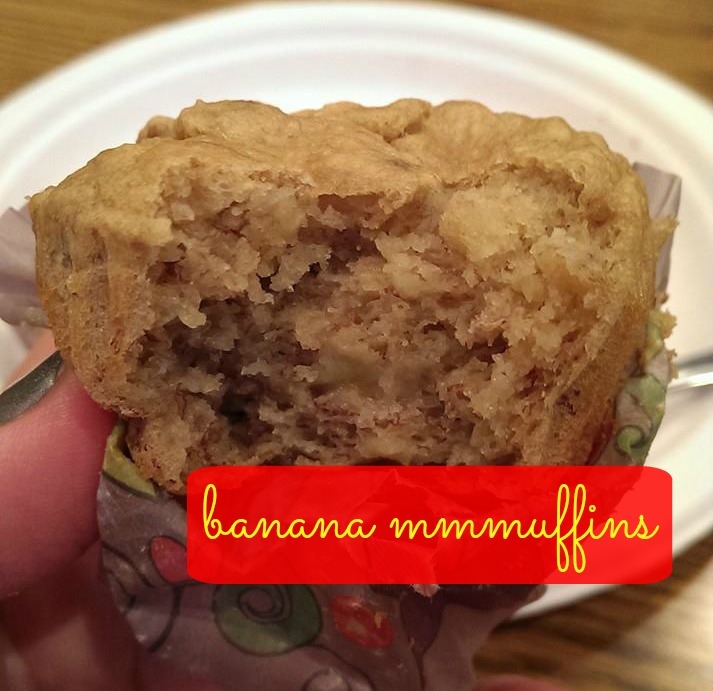 I added the oats at the end when it dawned on me that I was originally wanting to make banana oatmeal muffins. Next time I make these, they will be done with 1/2 cup wheat flour, 1/2 cup oatmeal. Before baking, I added mini chocolate chips to the tops of 6 of the muffins. With or without the chocolate, they are super sweet (hence wanting to eliminate the splenda next time). These would be awesome with some nuts, too. 12 muffins as followed calculate (on MyFitnessPal) out to 65 calories a muffin.